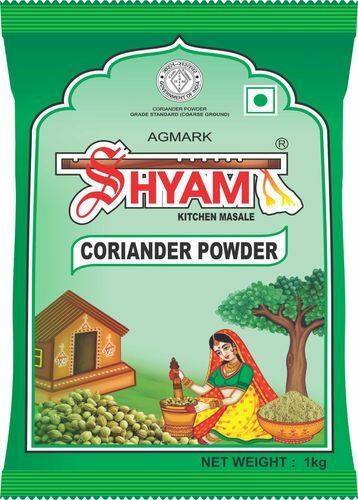 Shyam Dhani Industries deals in an extensive range of Shyam Coariander 1 kg, which is prepared using well-tested ingredients under the guidance of our experts. This range is highly appreciated among clients due to its delightful taste, longer shelf life, purity and freshness. We, “Shyam Dhani Industries,” are an ISO 9001:2008 certified company and well-known as one of the foremost Manufacturer, Exporter, Wholesaler and Supplier of Spices Powder, Premium Masala, and other Whole Spices. Our offered range encompasses Chat Masala, Sambhar Masala, Chana Masala, Kitchen King Masala, Garam Masala, Garlic Powder, White Pepper Powder, Turmeric Powder, Mint Powder etc. These spices are processed by our professionals using high-grade ingredients under the utmost hygienic conditions with the help of advanced technology. We offer these Indian spices in different packaging options to meet the variegated demands of clients. The entire range is known all across the globe for its unique taste, rich aroma, delicious flavor, purity and longer shelf life. These spices are widely used in preparing various delicacies and enhance the flavor of the food in which these are added. We are looking for queries majorly from Foreign Countries.